If you like music, and if you like a broad mix of cuisine, then head down to Taichung on May 23rd and 24th for the 6th Annual Compass Taichung International Food & Music Festival. Now one of the larger annual music festivals in Taiwan, this year is featuring 15 or 16 bands and a very large variety of cuisine on offer at vendor booths (last year had 52 booths) ranging from Indian to German to Cantonese. Once again, Festival Live Music Coordinator Patrick Byrne has served up a tasty list of bands both Taiwanese and foreign (see sidebar). Styles range the gamut from rock to punk, jazz to reggae, blues to country and folk and funk. 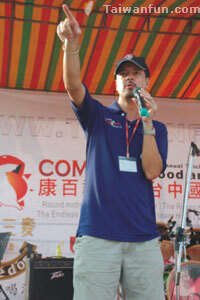 Mayor Jason Hu has expressed interest in returning again to our event for the sixth time. Like last year, it will be held at the Art Museum (WuQuan) Parkway, though unlike last year we're starting later in the afternoon and running it over two days (starts at 2 pm). The Art Museum (a notable landmark) is easily reachable by bus, with the event site located about two blocks to the south of the main entrance. Taichung can be reached by High Speed Rail in about one hour, or by bus in about two hours and 15 minutes. Celebrating the 16th birthday of the Compass Magazine has been made possible by the generous support and sponsorship of the Art Museum Parkway Management Committee, Taiwan Beer, Columbia Consulting, Ministry of Economic Affairs Department of Commerce, Taichung City Government, Tribe Bay Advertising, EZTable.com, Yi Jan Management Consulting, Sunny FM89.1 and our friend Patrick Byrne. Acts include: The Money Shot Horns, .22, The DoLittles, Hand Knife Club, Wailin' Soul, Dr. Reniculous Lipz, Dirty Skies, 3 Day Bender, Militant Hippi, Moss, Round Midnight, Rage Against the Cash Machine, Reider, Alice's Tears, Nine Doors and (to be confirmed) Way Soon. Taiwanfun Magazine is required by law to remind you not to drink and drive.